How can you prepare a horse for being ridden in a dress? “Hi Stacy! My sister’s grad is coming up and we were hoping to take pictures of her with/on her horse in her grad dress. I was wondering if you would have any tips on training a horse to accommodate her in her dress. Thanks!”-Fallon S.
I have shown several different horses while wearing a dress, one was even my wedding gown! Two of my freestyles were done while wearing dresses and I have also shown in mounted shooting while wearing a full skirt. I didn’t have to do any special training with my horses because I had already done so much training prior to mounting up with the dress. The horses had been sacked out with plastic bags, tarps, coats, rain coats and numerous other items. In addition, the horses had all worn sheets, blankets and coolers themselves. I believe that all of these experiences helped to prepare my horses for being ridden in a dress. Maybe a bigger thing to consider would also be the atmosphere that the horse will be in. 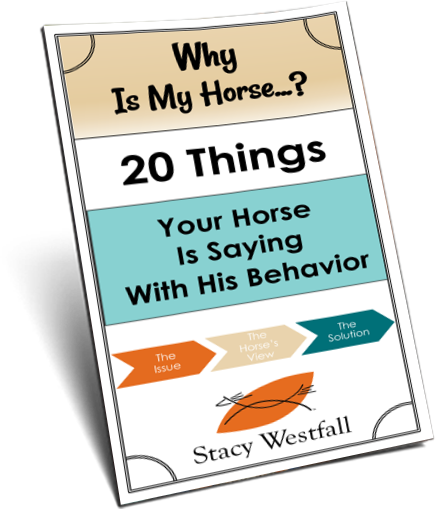 I have seen horses that were well behaved in their own barn get spooked by large crowds of people and flashing cameras. On the surface it might look like the horse was spooked by the dress, when in reality it was a large number of new and unusual things that set him off. Again, my horses had been show horse so they had already been previously prepared for this type of pressure. One last thing to keep in mind is, well, comfort. If your sister is planning to sit ‘astride’…assuming you don’t have a spare side saddle somewhere, she will want to consider wearing something under that dress. When I was mounted shooting I wore breeches under the skirt. When I wore the black dress I had on a pair of heavy leggings and when I wore my wedding dress I had on a pair of jeans. Just a thought. I would consider all of the things mentioned above and figure out ways to train for them. If the dress is a very unusual material or has some kind of feature that you think could cause a problem then figure out a way to address this ahead of time. Draping material across the rump that can easily be removed if the horse is bothered is always a good step. Another great idea would be to do a mock up photo shoot in advance of the ‘real’ thing. The Salvation Army or Good Will are great places to shop for dresses that may have a similar cut but can be worn in the barn, lol. 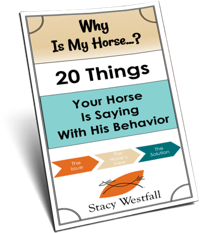 This will allow you to do two things: confirm that the horse is properly prepared (because of all of your training) and allow you to figure out what angles are flattering to both the horse, rider and dress…which could end up being the biggest challenge you have. ← All horse training is trick training, right? My daughter had wedding photos taken in her dress. It was a very quiet trail horse and they prepared him for it by asking him to wear a loose sheet blanket, first on the ground then being ridden. Start with your horse on the ground, wearing a sheet over his back and rump. If he is used to wearing a horse blanket already progress to a bed sheet. When he is used to this ride him with it tucked under the back of the saddle so it can be pulled off easily. Next take the sheet and tuck it into your waistband or belt, draping it right out over his rump. I used this method to prepare my horse for parades. Getting used to the flowing costume was easy. It took about an hour or my time and his. Getting used to the noise, crowds and other distractions took months of work. Once he is ok with the sheet, wearing a dress is pretty much the same but as Stacey says, prepare him also if it has ruffles, glittery bits etc that didn’t appear on your sheet.